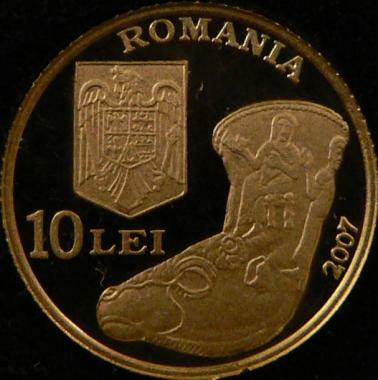 Obverse: ROMANIA,, coat of arms of Romania, face value 10 LEI, the rhyton of Poroina, year 2007 Reverse: the rhyton, two personages represented on the rhyton, inscription "RHYTONUL DE LA POROINA" meaning "THE RHYTON OF POROINA"
A rhyton is a cup having the shape of a drinking horn, with the end usually modeled as an animal head. This cup is made of silver, with several parts gilded, and was discovered in the 19th century in Poroina Mare, a village from Mehedinţi county. The rhyton is 9 centimeters in diameter at the rim, 28 centimeters in height and it weighs approximately 350 grams. The tip of the cup is shaped as a bull head. The bull has no horns, ears or eyes (elements that initially existed). On the rhyton four personages are represented, all dressed in chiton, with bare arms and legs, are represented. Two of them are represented sitting on stools, holding rhytons in hand. 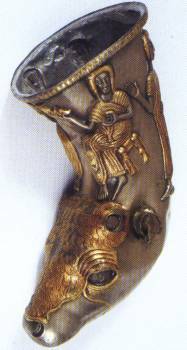 Most probably the scene depicted on the neck of the rhyton is a religious one, the four personages being priests performing a sort of ritual. The rhyton of Poroina is considered to have Thraco-Getic origin, being dated in 5th-3rd century BC. The adornment has certain Thraco-Getic elements, but also Iranian and Hellenistic elements. The rigid attitude of the personages and the schematic representation shows that the rhyton was crafted, most probably, in a local workshop. Nowadays the rhyton can be admired at the National History Museum of Romania in Bucharest. 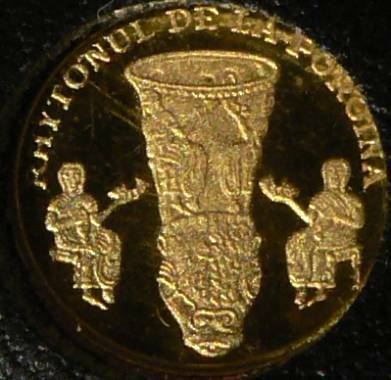 The 10 lei 2007 gold coin (rhyton of Poroina) pictures above are present on the site through the permission of an anonymous donor.